Fans are encouraged to be in their seats by 6.45pm for the pre-game ceremony, as we pay our respects to past and present members of the Australian Defence Force. 6.45pm: Pre-game ceremony begins. The moving pre-game ceremony will feature a performance by the Australian Army Band, before the torch lit from the Eternal Flame makes its way around the arena. Following the lighting of the cauldron, the Last Post will be observed, along with the Australian and New Zealand National Anthems. 7.20pm: Melbourne and Richmond players run through a shared banner. As a Replacement Game, Melbourne Members with home game access can enter the game by scanning their Membership card or using their Digital Card in the Melbourne FC app. With a large crowd expected, general admission Members are encouraged to upgrade to reserved seats. Visit Ticketek to secure your seat for the clash. Tickets to the match can be purchased via Ticketek. 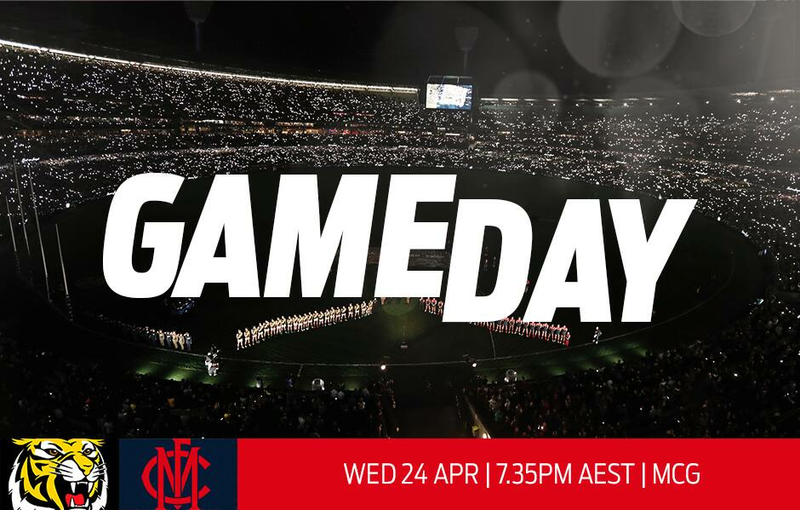 With a crowd of 80,000 anticipated and increased security measures in place, all fans are encouraged to arrive early and be in their seats by 6.45pm for the pre-game ceremony. The MCG is in close proximity to Jolimont and Richmond train stations. Use PTV’s Journey Planner to map out your trip to the game and view disruptions. For safety and security reasons, no public parking will be available in Yarra Park. Our Membership team will be located outside Gate 3 for all your Membership queries and purchases. The Demon Shop on Brunton Avenue will be open from 10.00am until 30 minutes after the game for all your red and blue merchandise needs. Can't make it to the game? Shop the full range online. Melbourne will wear a special tribute ANZAC Day Eve Guernsey on Wednesday night, honouring the 30 past Melbourne players who never returned from war. The guernsey can be purchased in The Demon Shop, with part proceeds going to the RSL. Match worn guernseys will be available to bid on post-game at melbournefc.com.au/auctions. Live scores, stats and match highlights are available at the tap of a finger in the club's mobile app. Follow the club on Facebook, Twitter and Instagram for live match coverage and a behind-the-scenes insight into match day. Following the ANZAC Day Eve clash, the Casey Demons will play Richmond in a home fixture at Casey Fields. The game will be preceded by a practice match between Casey and Hawthorn’s VFLW teams from 11.00am.